The story of one family's persecution for their faith. 43 pages. Thomas F. Heinze, 23 pages. Fascinating story of a Christian family facing unspeakable persecution under Soviet Russia. Landmark Baptist Press edition for free distribution and not for resale. A must-have for grades 8 and higher, the English Handbook contains grammar rules, list of prepositions, Dewey Decimal System, composition tips, research paper information, punctuation, capitalization, diagramming, and more! A FREE daily devotional produced by Landmark Baptist College. Includes Bible reading schedule. You can request to be added to the mailing list if you would like regular issues. A procedures guide geared toward working with your students at home. 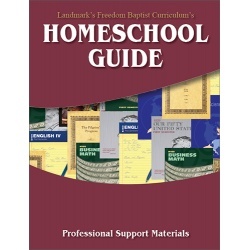 Every homeschooler needs this guide, and this one is free for a limited time! Order one Student Grade Report for each student. Free with your curriculum order. note: This product is a downloadable pdf file. You may also order printed copies at no cost from the store. The 2018 Landmark's Freedom Baptist Curriculum catalog has been updated with the latest course offerings, many new cover upgrades, SOAR introduction, new discount and referral bonus policies, and informative course descriptions for all subjects and grade levels. Free download also available from store. The 2018 Landmark's Freedom Baptist Curriculum catalog has been updated with the latest course offerings, many new cover upgrades, SOAR introduction, new discount and referral bonus policies, and informative course descriptions for all subjects and grade levels. This product is a downloadable pdf file. Free printed copy also available from the store. Order one Student Grade Report for each student. Free with your curriculum order. note: This product is a printed copy. You may also order a downloadable pdf file at no cost from the store. 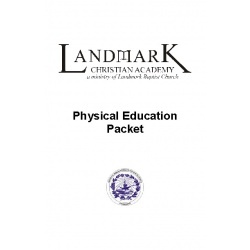 This is a clear and succinct overview of the Landmark Christian Academy program. It highlights the many benefits offered, graduation requirements, and a cost breakdown showing the great value of this optional resource. -this product is a downloadable pdf file. If you would like a physical copy, please contact our offices. This is required for earning one high school credit for Physical Education. Keep a log of your activity and submit with your grade reports. Note: this product is a downloadable pdf file. Free printed copy also available on store.